Teams presented their solutions in a 2-tiered review session on June 28 at IMCC5. REVIEWERS selected the top seven teams. JUDGES selected the prize-winning teams. The Judges will select the prize-winning teams. Aileen Tan Shau Hwai is a Professor in the School of Biological Sciences at the Universiti Sains Malaysia (USM). Currently, she is the Director of Centre for Marine and Coastal Studies (CEMACS) at USM and the Executive Director of the Asia-Pacific University-Community Engagement Network (APUCEN). She was elected as the first woman president of the UNITAS Malacologica in its 53-year history, which is based in Belgium, from 2013-2016. Professionally, her field of expertise is in marine science, specializing in mariculture and conservation of molluscs. She is the first Malaysian woman who has successfully culture the oysters from eggs and sperms through artificial spawning. Her work on oysters, as featured in the website of World Oyster Society, has gained vast recognition, not only in Malaysia but internationally. She has many research collaborations with scientists from Thailand, Indonesia, Japan, Vietnam, Philippines, China, Australia, USA, UK and Denmark. Her pioneer oyster project in generating additional and sustainable income to the fishermen in Merbok, Kedah received 1st place in Entrepreneurship by University-Community Transformation Centre (UCTC), Ministry of Higher Education Malaysia 2015. Aileen is also involved in building human capacity, receiving the Best Women Scientist Award for her work in empowering the women of the Johore Islands to earn their own income through the giant clam conservation programme. To date, she had published more than 100 articles in various scientific journals, monographs, proceedings, conferences and seminars. Alex Dehgan is the CEO and co-founder of Conservation X Labs, a startup for tech innovation for conservation and development. Dr. Alex Dehgan recently served as the Chief Scientist at USAID, with rank of Assistant Administrator, and founded the Global Development Lab. Prior to USAID, Alex worked in multiple positions within the Office of the Secretary, and the Bureau of Near Eastern Affairs, at the Dept. of State. At State, Alex developed political and science diplomacy strategies towards addressing our most challenging foreign policy issues in Iraq, Egypt, and the greater Islamic world, including engagement with Iran under the Obama Administration with Amb. Dennis Ross. As head of the Wildlife Conservation Society Afghanistan Program, Alex helped create Afghanistan’s first national park. Dr. Bay is a Senior Research Scientist and Team Leader for Reef futures: Adaptation and Resilience of Coral Reefs at the Australian Institute of Marine Sciences, AIMS. She is also part of the Australian Reef Restoration and Adaptation Program where she is coordinating knowledge around proposed novel interventions on coral reefs. Her current research integrates physiological, genetic and genomic data to understand how corals interact with their environment. In particular, the rates and mechanisms of physiological acclimatisation, and the potential for genetic adaptation in response to climate and ocean change. Dr. Bay has over 60 scientific and technical publications. 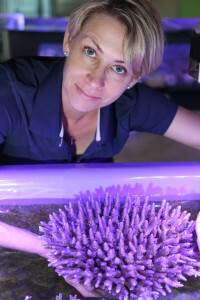 Outside of AIMS, she is an Editor for Coral Reefs, and an Associate Editor for BMC Evolutionary Biology and Frontiers, and she's an adjunct senior lecturer at James Cook University, Townsville. Edward joined the Sustainable Places Research Institute as a Research Associate in 2017. Edward is an Environmental Sociologist with a particular focus on marine environments. His research interests include investigating applications in conservation policy for the experiential knowledge of resource users, as well as protected area governance, and citizen science. He also studies issues of inclusion in the academic community, particularly in relation to diversity at professional conferences. Currently, Edward is working on the Sustainable Places Research Institute led Land2Sea Project, assessing connectivity of land-use governance and coastal zone management in Quintana Roo, Mexico. He is also the President Elect of the Marine Section of the Society for Conservation Biology, as well as the Chair of the 5th International Marine Conservation Congress in 2018. Deputy Director, NOAA Coral Reef Conservation Program. As the deputy director of NOAA’s Coral Reef Conservation Program, I work with the director to manage the program’s day-to-day operations, including coral conservation policy development, program implementation, budget development, and personnel management, as well as domestic and international partnership building and program development.